Do You Want To Build A Snowman? 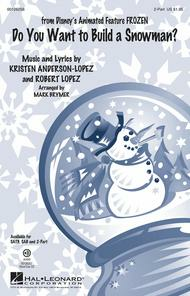 composed by Robert Lopez and Kristen Anderson-Lopez. For piano, voice and guitar (chords). Disney; Film/TV. Piano/Vocal/Guitar. 9 pages. 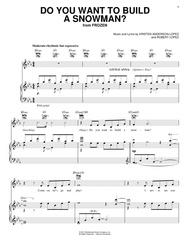 Published by Hal Leonard - Digital Sheet Music (HX.282747).About Digital Print Sheet MusicDigital Print is printable sheet music available anytime, anywhere. Just purchase, print and play! View your online sheet music at home, school, work or anywhere you have a computer connected to the Internet. Use our iPad app to view your digital sheet music on the go. With Digital Print, you can print your digital sheet music immediately after purchase, or wait until its convenient. And our software installation is easy - we'll guide you through the simple steps to make sure you have Adobe Flash Player, Adobe AIR and the Sheet Music Plus AIR application. Do You Want to Build a Snowman? (from Frozen). By Kristen Bell. By Kristen Anderson-Lopez and Robert Lopez. Arranged by Mark A. Brymer. For Choral (2-Part). Disney Choral. Octavo. 12 pages. Published by Hal Leonard (HL.126256).A surprise hit from the Disney animated film Frozen, this tender song depicts the relationship between the two sisters, Anna and Elsa. With an emotional impact that has resonated deeply with audiences and its steady climb up the charts, your choirs will love to perform this new wintertime favorite! Available separately: SATB. SAB, 2-Part, ShowTrax CD.